Another set of bargain bin Halloween costumes. Pretty sure samurai usually have more than one small pleat of armor on their outfits. Paine is one giant regret: that helmet, the rainbow flares, and the soda can loops on her arms. Rikku is surprisingly boring besides whatever is growing out of her forehead. 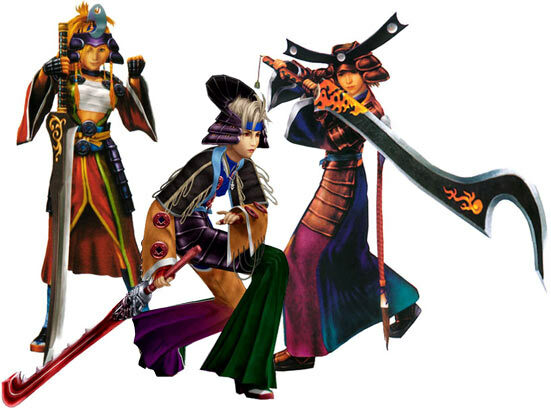 Yuna seems the most “samurai” of the lot, but that sword looks like a giant can opener. Ok, Rikku is now wearing a bird on her head? Tell me that isn’t a bird head. The split in her robes makes it look a little more pirate-y than samurai. Paine…so many things went wrong for you. The giant buttons, the pleated bell bottoms, fringe arms? You are the worst. I really like Yuna’s robes and colors and her sword definitely is the most fearsome. Paine and Yuna must have been reading the Rainbow Brite guide to samurai. So many bright colors! I’m not sure why birds on heads are so offensive to you, but overall I like Rikku’s outfit and sword the best. Yuna gets a slight edge over Paine for a helmet that might somewhat useful. Paine’s would even protect her from Rikku’s bird’s droppings.